Dental implants have truly changed the replacement of teeth over the years. Before the development of dental implants, people with dentures were unable to chew many kinds of food. This has all changed with the widespread use of dental implants. 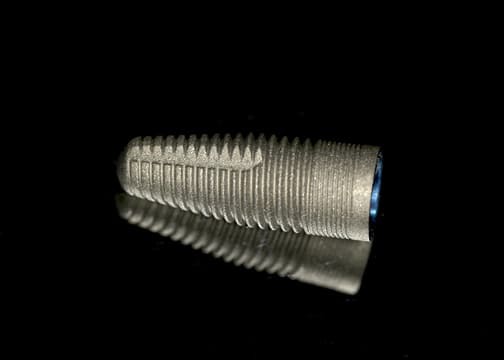 Dental implants are made up of titanium and other materials that are compatible with the human body. They are posts or frames that are surgically positioned in the jawbone, where they function as a study anchor for replacement artificial teeth, known as crowns. Dental implants fuse to your jawbone allowing for the most stable support for a crown, bridge or mounted denture. Bridges and dentures that are mounted to a dental implant will not shift or slip in your mouth, allowing you to speak and eat normally- something that is so very critical to your everyday life. A dental implant is an excellent way to replace a missing tooth. This solution feels and acts the most like a natural tooth when smiling, brushing and chewing. The implant replaces the actual root of the missing tooth and heals in the bone for several months. A major advantage is no need to alter any other teeth when placing an implant. A dental implant is a good solution for just a single missing tooth or multiple missing teeth. When smiling or talking there is no way to tell the difference between a dental implant and your natural tooth. A periodontist can help prevent tooth loss. A periodontist knows the specific treatments needs in order to save your natural tooth. The treatments that a periodontist will provide will remove damaged tissue and if done in time can prevent further infection from spreading which can save a tooth from removal or a root canal. A periodontist can replace missing teeth. When a need arises when teeth need to be removed your Periodontist has a detailed understanding of the relationship between tooth, gum, and jaw bone structure and will take the proper care needed to remove a tooth.